As the number of his brothers and communities increased, Dominic constantly traveled among them to encourage community members in their undertakings. After stays in Paris and Prouille he returned to Rome in January 1218. The eloquent preaching of the friars in Italy had attracted much attention–they are said to have been the first religious to preach publicly in Bologna–and admiration for them increased when it was learned that they were disciples of Dominic, whose fame had by this time spread throughout the country. One of the most compelling events in the infant days of the Dominican Order was the miraculous feeding of the brothers at St. Sixtus Convent in Rome. It not only reveals Dominic’s profound faith and deep confidence in God’s help but also illustrates the true spirit of poverty. Because the friars had given all they had to the poor, they had no food for themselves, so two were sent into the city to beg. At the end of the day they had received nothing. When they returned to the refectory, an ample supply of bread appeared at Dominic’s intercession. Two angels carrying loaves of bread in two white cloths that hung from their shoulders miraculously appeared in the refectory and began to serve the brothers, beginning with the youngest member of the community. When the last loaf was placed in front of Dominic, the angles disappeared. 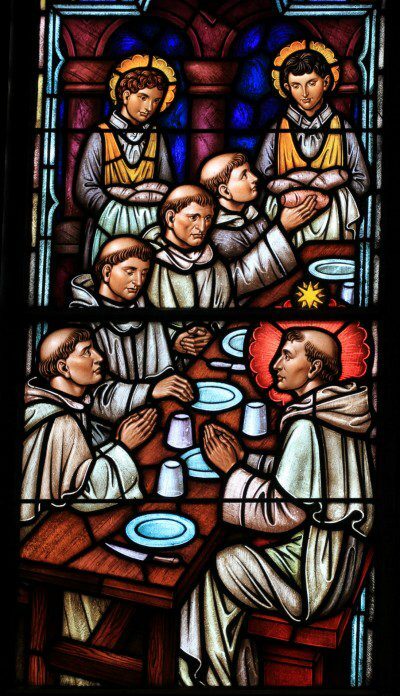 Since then Dominican priories and convents have commemorated this miracle by serving meals first to the younger members of the Order.